We strive to be a good community citizen. 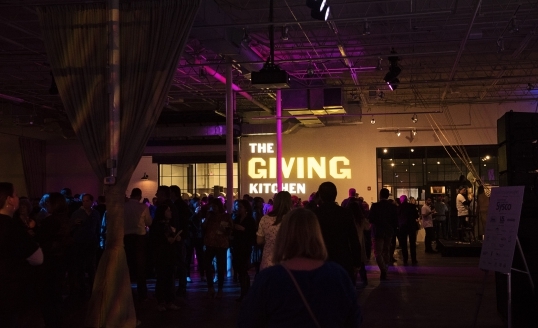 While most of our energy, time and resources is focused on the efforts of The Giving Kitchen, it is our responsibility to make significant contributions in order to strengthen the health, social, educational, and cultural fabric of the community we call home. Founded by Chris Hall, Ryan Turner and Todd Mussman, Giving Kitchen (GK) is a nonprofit organization whose mission is to provide emergency assistance to restaurant workers through financial assistance and a network of community resources. GK has helped over 1,100 restaurant workers since inception and has grown to help people in 47 counties throughout Georgia, with the goal of serving all restaurant workers in Georgia by 2020. Giving Kitchen grew out of a beyond-expectation response to the devastating, stage-four cancer diagnosis of Atlanta Chef Ryan Hidinger in December 2012. Ryan was well-known in the Atlanta restaurant community for his work at Bacchanalia, Floataway Café, and Muss & Turner’s. And he and his wife, Jen, were beloved for the supper club called Prelude to Staplehouse that they had been running for several years as a build-up to starting their dream restaurant. Spearheaded by Chris Hall, Todd Mussman and Ryan Turner, the fundraising event dubbed Team Hidi and “round up” requests at restaurants throughout the region raised nearly $300,000 to help Ryan Hidinger fight his battle. The community’s beyond-expectation response​ ​set the intent, beliefs and values of Giving Kitchen. In 2015, Chris, Ryan, and Todd were named Cornerstone Humanitarians by the National Restaurant Association Educational Foundation​​ ​for their continuing work with Giving Kitchen. In October 2015, Ryan & Jen Hidinger’s dream restaurant concept, Staplehouse, opened its doors in the Old Fourth Ward of Atlanta. Staplehouse is a for-profit restaurant wholly owned by Giving Kitchen, therefore 100% of all post-tax dividends go directly into the GK crisis fund to assist the restaurant community that lifted Ryan and Jen Hidinger up in their time of need. Supporting, promoting, and telling friends about Staplehouse is one of the most delicious, self-serving, and satisfying ways to help GK. Are you looking for a donation? Are you interested in partnering with us to help a specific cause? While we focus the majority of our resources on The Giving Kitchen, we always strive to help those in our local community. Please fill our the form below, and we will happily process your request. We hate to put you ‘through the hoops’, but we are inundated with requests each week and this system allows for parity and helps us greatly with our decision-making and record-keeping. We appreciate your commitment and time in assisting us to make effective decisions toward the betterment of our community.